Does the mind reflect or dictate what the body sees and feels? What is the language of emotion? Is memory a function of our imaginations? Are we all just out of our minds? 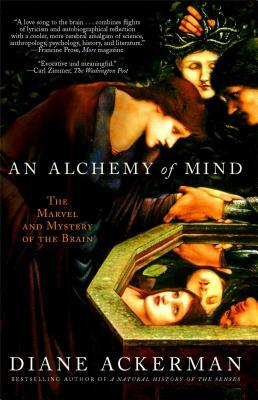 In this ambitious and enlightening work, Diane Ackerman combines an artist's eye with a scientist's erudition to illuminate the magic and mysteries of the human brain. With An Alchemy of Mind, she offers an unprecedented exploration of the mental fantasia in which we spend our days. In addition to explaining memory, thought, emotion, dreams, and language acquisition, Ackerman reports on the latest discoveries in neuroscience and addresses such controversial subjects as the effects of trauma, nature versus nurture, and male versus female brains. In prose that is not simply accessible but also beautiful and electric, Ackerman distills the hard, objective truths of science in order to yield vivid, anecdotal explanations about a range of existential questions regarding consciousness and the nature of identity.